T he days of children turning up their noses to cauliflower are long gone. It’s hard to decide which is better, roasted cauliflower, cauliflower soup, or pizza crust made from cauliflower. All of these are great recipes which we will be sharing on our website in the weeks and months ahead. They are all crowd (and children) pleasers. 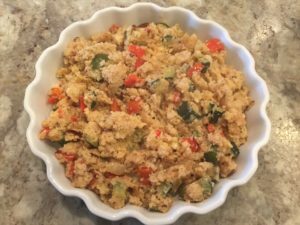 Today, we have a new competitor in town – Cauliflower Rice with Zucchini and Red Pepper! It is easy to make, incredibly delicious, and oh so healthy. 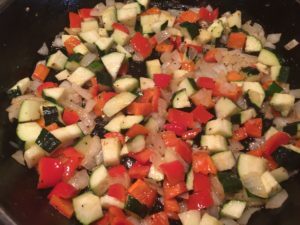 It is a sure winner as a side dish and with added vegetables (such as zucchini and red bell peppers), it can also be the main course for any week night meal. This week our Magical Foodlore Moments brought so many laughs at the community table as our guests shared their funniest (and worst) stories about vegetables. There’s the story of burying the boiled peas in the mashed potatoes, so you wouldn’t have to eat them, the story of trying to slip the dog your steamed brussel sprouts under the table (even the dog wouldn’t eat those), and many of us had to endure creamed corn at least once a week. Back then, steamed cauliflower was right up there with our worst vegetable stories. Well times have really changed – and for the better! We love our fresh vegetables. 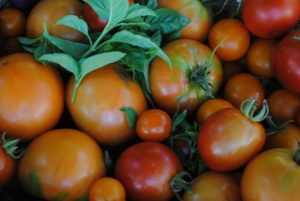 They are simple to make, fresh and so good for you. We can roast them, grill them, or sauté them. And, as with our Cauliflower Rice recipe, we can put them in the food processor and turn them into an amazing side dish. So many things can be added to our cauliflower rice; our creativity is our only limitation. Not only is this recipe delicious, it is also beautiful. The rich colors from the zucchini and red bell peppers makes for a beautiful presentation! Try our recipe first and once you get the right consistency for your rice, add the things you or your family love best to create your own unique version of this recipe. If you create a winning recipe using our cauliflower rice as your base, be sure to share it with us so we can share it with others. Your clever adaptations never cease to amaze us! Linda has been cooking with her Granddaughter Maia, since she was about 8 months old. Maia’s love of being in the kitchen inspired our first-in-a-series children’s book Someone’s Making Pancakes with Grandma. 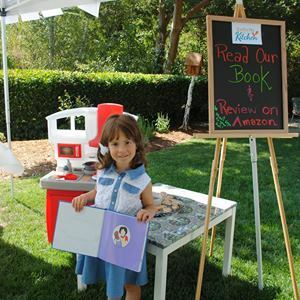 The book is about a child having fun cooking in the kitchen with her grandmother. At Two Friends in a Kitchen, we believe that special memories and favorite stories (we call them Magical Foodlore Moments) are created as people cook and prepare meals together. When you are in the kitchen, there is time for chopping, mincing, dicing, mixing, blending, and grating in addition to creating and tasting. And, there is also time for fun, laughter, serious conversations, problem solving, creative thinking, life lessons, and so much more. Those Magical Foodlore Moments are the kind of memories and moments that last a lifetime! 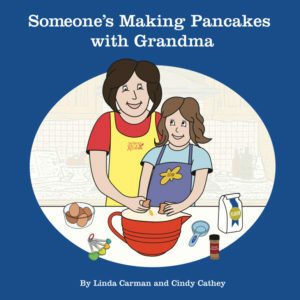 Our book Someone’s Making Pancakes with Grandma is all about creating special moments in the kitchen. 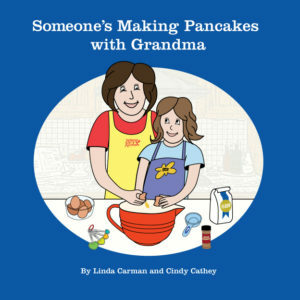 The book tells the story of a special time between a granddaughter and her grandmother as they make healthy pancakes together. The book includes our famous pancake recipe and a word list that can be used to help teach early reading skills. Our book can be a favorite bedtime read aloud, a young child’s early reader, or an inspiration to try cooking up something special in the kitchen with a child you love, so you too, can create your own Magical Foodlore Moments! 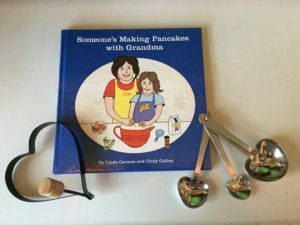 Our book can be purchased from our webstore at www.twofriendsinakitchen.com along with many of our favorite kitchen items. It can also be purchased at Amazon.com. Our book gift sets are available exclusively at our webstore (shipping is free for orders over $25). If you have a Magical Foodlore Moment to share with us, we’d love to hear from you. 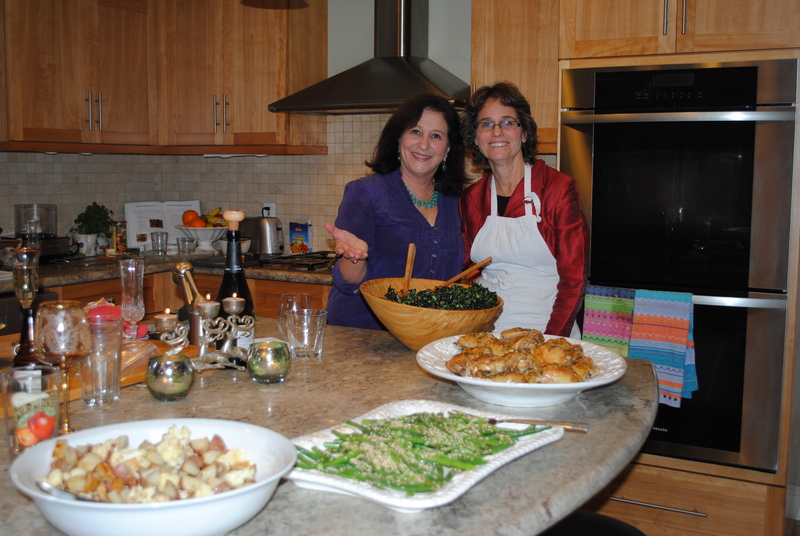 Write to us at www.twofiriendsinakitchen.com to share your Magical Foodlore Moment or photo as so many others have. We love hearing from our followers! cake or you can use cute little molds and make 50 or more little heart or star shaped cakes. This one is great for Valentine’s day or the Fourth of July. You can offer your family and friends a hefty slice of cake or a bit size morsel of deliciousness! Th e recipe can be found at: http://twofriendsinakitchen.com/category/dessert. 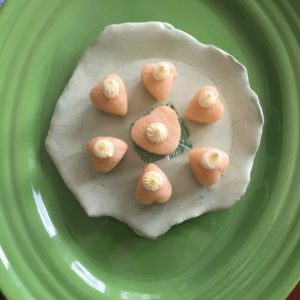 I spent a couple of hours on a Saturday recently making little bite-size, heart shaped “cakes.” By the time I was done, I had made almost 90 little hearts. However, I doubled the recipe in preparation for a big event that Linda and I were hosting for our closest family and friends. I digress for a moment to fill you in on this amazing debut party! The event was to celebrate the official launching of our first-in-a-series children’s books, which of course centers around cooking and having fun in the kitchen. This first book, Someone’s Making Pancakes with Grandma was inspired by Linda’s granddaughter Maia, who loves to cook with Linda! Maia and her little sister Harper love making and eating our delicious zucchini and carrot pancakes. At the event, our guests also had a sneak peak at our cooking classes by making homemade gnocchi and two fabulous no cook sauces (Ricotta and Red Pepper sauce and Linda’s best-in-the-world pesto sauce. They shopped in our store where they not only found great products, but great bargains as well. Check out our website and go to the Store tab to purchase our wonderful products: http://twofriendsinakitchen.com/two-friends-shop. We ended the celebration with dessert which of course was our lemon, yogurt cakes, in the shape of little hearts. Our way to say “Thank You” to the special people in our lives. I pulled them from the freezer, put a little dollop of lemon frosting on them, arranged them on a gorgeous platter and had dessert for 50 ready in a flash – doesn’t get any easier than that! These cakes are fabulous without any extras, but we encourage you to try them with slices of raspberries. As you finish making the batter, just fold in your raspberry slices for a tasty little surprise. Add a dollop of lemon frosting (yes, you can use canned frosting) on top of each heart an extra, extra little treat. Today we are making our Two Friends in the Kitchen Chili for a Crowd. No need to worry. Let’s start at a very basic level – preparation. The Importance of Preparation: Having all of your ingredients laid out and ready to go is an often forgotten step. Don’t assume you have the ingredients for this recipe (or any recipe for that matter); get in the habit of checking to make sure you have what you need to get started. This will allow you to make this chili in less than 30 minutes. With this large batch, you can serve a family dinner, freeze left over batches for future meals, and/or prepare for a large group of friends coming over to enjoy a simple yummy dinner. 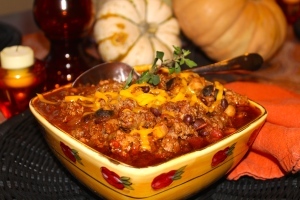 Our Chili recipe is presented to you in both video and recipe form. If you are wanting to see the step by step processes and learn some helpful cooking tips of the trade, the video will demonstrate the techniques used, show helpful kitchen tools that make cooking easier, and walk you through the entire process. Either way, this chili is a winner! Linda prepares this chili every year on Halloween. All the families who join for trick or treating come by an hour before departure to enjoy a hot bowl of this chili with a unique twist of lemon and basil. The lemon and basil create a rich contrast to the chili powder and cumin making this chili one that stands out in a crowd. It is no wonder that the group joining for Halloween continued to expand and grow as word spread of the tantalizing start to the fun, always memorable evening. A hot spicy chili is the sign of autumn in our family. This is the dish of Halloween when a crowd of happy goblins arrive at your door with their proud parents just prior to trick-or-treat to break bread together. The rich, red, aromatic, chunky scoops of chili on top of a bed of white or brown rice gives instant energy to the trick-or-treaters about to scope out the best house for candy and treats. This recipe can be made ahead and stored for up to a week in the refridgerator or packaged airtight and frozen for up to 6 months. It tastes better the next day so make a lot to share! 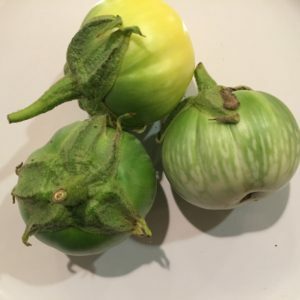 In a large soup pot, add the olive oil and onions; sauté until soft and translucent. Take the pot off the heat and set aside. In a separate large frying pan, cook the sausage over a medium heat until lightly brown on all sides. Continue to crumble the sausage as it cooks with a wooden spoon or spatula. When cooked, put sausage in a bowl and set aside. Using the leftover oil from the sausage, add the ground meat to the same pan and sauté until lightly brown; remove and add to the bowl of sausage. Cook the turkey in the same manner and set aside with the other browned meats. Return soup pot to the stove and return to a medium heat. Add all the spices to the onions and olive oil, mixing them together until well blended. Reduce the heat to low and add garlic, cooking for 1-2 minutes. Next, add the paste and mix into the spices, onions, and garlic. Increase the heat to medium once again and slowly pour in the wine and lemon juice, stirring until well-blended. Add the beans, meats, olives, and tomatoes, one at a time, gently stirring them into the mixture. Cook over medium heat for 30 minutes and serve hot in bowls either alone or over rice. 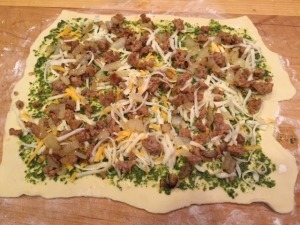 Add toppings as desired: cheese, chopped onions, or a dollop of sour cream. 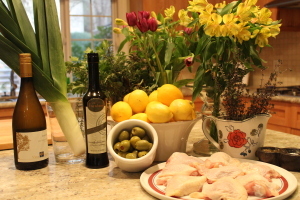 Chicken with Leeks and Green Olives! You will be shocked at how easy this is to make and how amazing it tastes! The great thing about this recipe is that you can prep it in about 30 minutes and then pop it in the oven to cook while you do other things. Don’t forget to make sure you have all the ingredients. Two Important tips about this recipe (and cooking in general): First leeks! Besides being incredibly healthy for you and filled with lots of important nutrients, many people consider leeks to be more savory than onions and we agree! They have a more delicate flavor than onions and they add a subtle sweetness to this dish. One thing to remember about leeks is that they need to be soaked in water for several minutes to eliminate any sand or dirt. Click out our recipe for more details. Searing Meats Needs Patience! Patience is important for a cook. To properly sear or brown meats, you leave them alone in the pan. You don’t move them around, you don’t keep checking on them. You let them brown according to the time recommended for each cut of meat or poultry. This gives the meat a slight crispness on the outside while keeping the meat juicy and moist on the inside. For me, not peeking at the meat while it was browning, was hard to do. I had this uncontrollable urge to keep looking to make sure the meat was searing when in fact I was interrupting the searing process. So don’t peek; be patient. Set your stove temperature as directed, follow the time recommendations, and let your meet brown. If being patient is not your strong suit, set your timer and step away from the stove and keep yourself busy by setting the table, or chopping ingredients – the result will be well worth it! Every time we serve this dish, our family and friends rave about the flavors and about how moist the chicken is – even the people who don’t typically eat chicken thighs. They love this recipe! 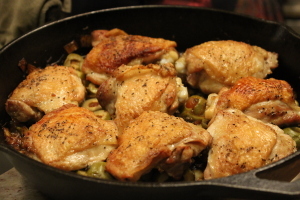 Crispy on the outside and soft and tangy on the inside, these chicken thighs smothered in a bed of leeks and green olives will melt in your mouth. This is a meal you can whip up in 30 minutes and put in the oven to bake while you set the table and dress the salad. Serve with salad and rice or potatoes. We use chicken thighs with skin on but you can use boneless/skinless thighs or chicken breasts as well. Prepare chicken by patting dry with a paper towel; lightly salt and pepper both sides. In a medium sized oven proof frying pan, add the olive oil and bring to a medium high heat. Add chicken thighs, skin side down, to the prepared pan and sear on medium high heat for 3-4 minutes or until chicken is golden brown. Turn chicken and sear on the other side for another 3 minutes. Remove chicken to a platter and set aside. Remove pan from heat. Cut the white portion of the leek into 1/8 inch slices and place in a bowl of water to soak for 10 minutes. Make sure the leeks are completely covered in water. Drain leeks and rinse again, if needed, to ensure any sand is removed. Return pan to medium heat. Add leeks and sauté for 6-8 minutes until translucent and soft, but not brown. Stir occasionally with a wooden spoon, breaking the leeks apart from their circle shape. When leeks are soft and just turning golden, add thyme, olives, salt and pepper. Gently mix until combined. Return chicken to the pan, skin side up, placing on top of the other ingredients and bring to a simmer. Remove pan from heat. Transfer pan to oven and cook for 20-25 minutes until skin is brown. Garnish with chopped parsley. Here’s a great, unique, fun appetizer that disappears as fast as you put it out! Our sausage and pesto roll is, of course, easy to make and so delicious. 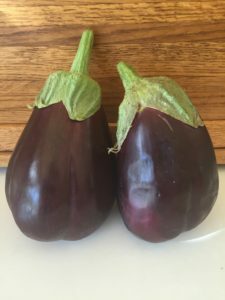 We used to serve this as the main course, but then realized if we cut it into smaller pieces, it makes the best appetizer ever! Serve as a hot appetizer or as an entre. If serving as an appetizer, cut into small 1/4 inch slices and arrange on a platter to serve. Defrost pastry sheet and lay flat on a lightly floured surface. 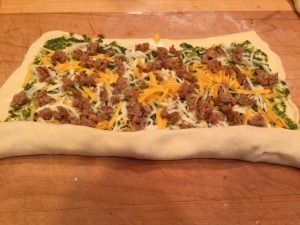 Roll with a rolling pin until 1/8 inch thick keeping a rectangular shape. Evenly spread the pesto over the entire surface. Remove sausage from the casings and crumble into a medium sized frying pan. Brown sausage over a medium heat, continuing to break the sausage into smaller pieces as it browns. Continue browning for 5-7 minutes or until sausage is lightly brown and cooked through. To carmelize the onions, add 1 tablespoon of olive oil to a medium sized frying pan. Heat oil over medium heat. Add onions and cook for 5-8 minutes or until translucent and golden brown. Evenly spread the sausage, onions, and cheeses over the pesto. Roll the pastry starting at the long end of the pastry until fully rolled. Place the rolled pastry on a greased baking sheet and brush with olive oil. Bake in a 400 degree oven for 20 minutes or until pastry is puffed and golden brown. Take out of oven and rest for 5 minutes before cutting into 1/4 inch slices if serving as an appetizer or in quarters for an entre serving. An Important Tip About the Dough: You can of course make your own dough for this recipe. It is so much easier than you would think. All you need is a little flour, yeast, salt, water and you are good to go. However, if you are in a real hurry, Pepperidge Farm puff pastry sheets are our go to alternative. It’s easy to find in local stores and is the closest to homemade dough that we have found. Did I tell you that Linda and I teach cooking classes in the Bay Area? Sometimes we teach to groups as small as 8 and as big as 30. We served the sausage and pesto roll as an appetizer at one of recent classes and it was as if our guests had never had anything like it. With every bite, the rave reviews just kept coming: “Wow! this is amazing!” “What is in this, this is the best ever!” “Can I have just one more piece (even though they had already had three pieces).” Back to our classes. At the end of every cooking class, the group sits down together at the community table and enjoys the meal that they have prepared. Every group is different and they all share great stories that make us laugh, cry and we walk away from the table feeling inspired and connected to each other is ways that are sometimes hard to explain. During one of our cooking classes, we asked the group to come ready to share something they were good at. During the meal, we went around the table to tell our stories. One person shared the loving story of his grandma making him chicken soup when he was a little boy and he was sick, and another shared how she had learned the art of making their famous family meatballs in the basement of their New York apartment in a winter storm. But probably the most magical moment was when one of our guests brought out his ukulele and started playing. We were all mesmerized. He played songs that most of us knew and we all just spontaneously started singing along with him. We ended up singing for almost an hour, not wanting the night to end. But alas, everyone needed to go home! This cooking class led to another great idea. For my next big family get together I am going to have everyone come ready to share something that they are good at. While of course, we know each other really well, when 22 get together, sometimes, it can be a crazy loud time and we can’t really catch up on what everyone has been up to. Who knows what surprises we’ll discovery as everyone shares their latest “thing that you are good at.” It may be our next new recipe! Whether you want to try great new recipes, become a better cook, have more fun in the kitchen, or learn how to cook from your heart, there will be something for everyone each week on this website. Whether you decide to follow them yourself, or with a special friend(s), or with your son, daughter, spouse or partner, join them at www.twofriendsinakitchen.com.